Today's post is a classic OOTD (Outfit Of The Day). 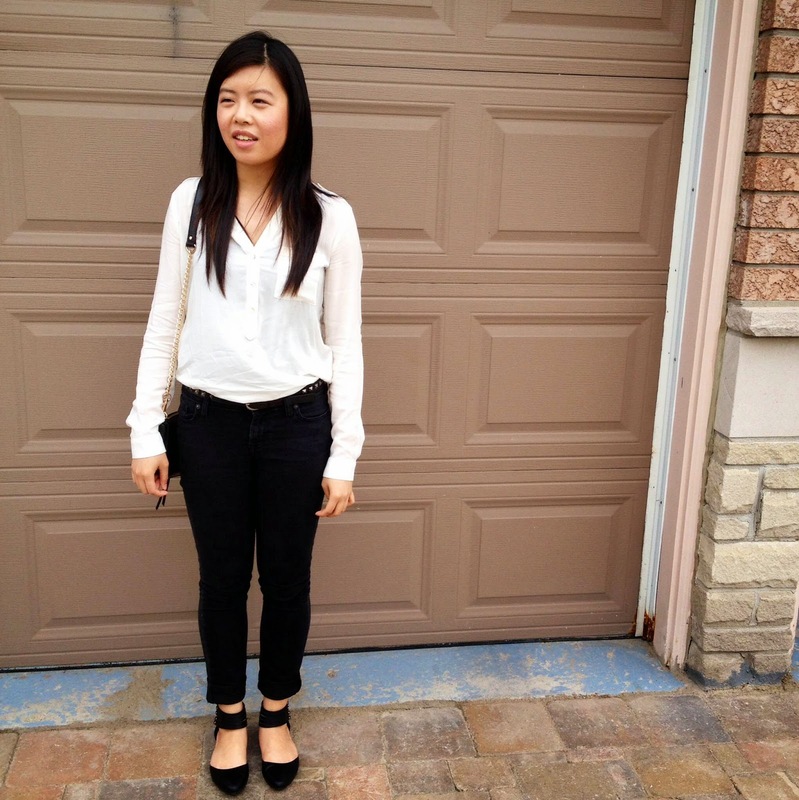 I wore this to my Aritzia interview so I did not have to dress super formal or business-like. 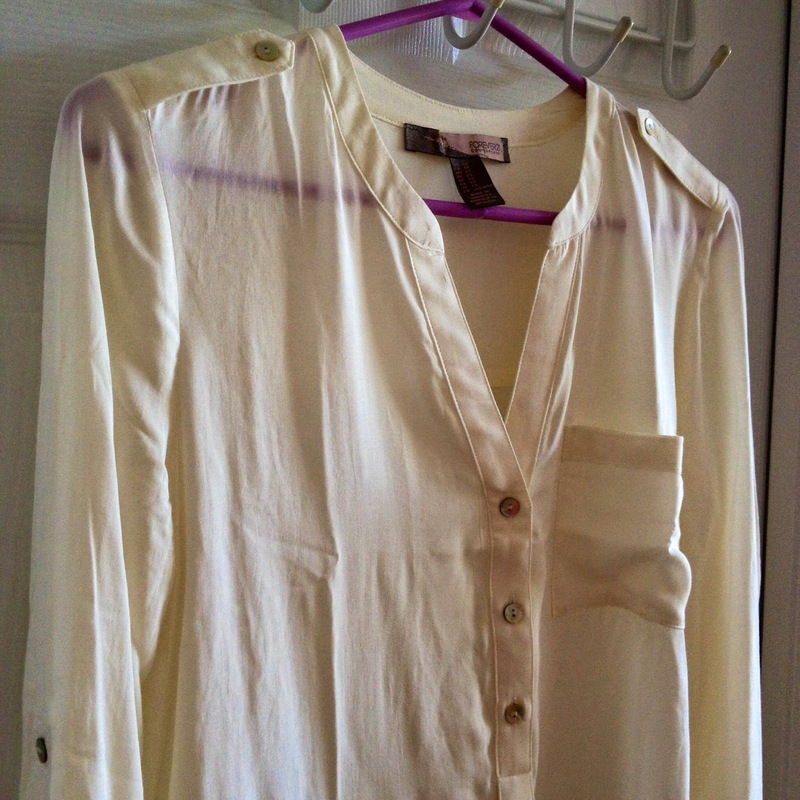 The blouse has a chest pocket on the front and epaulettes on the shoulders. It has a banded, V neckline and the sleeves can be rolled and held up with an inner strap that attaches to a button on the sleeve. I like this detail as you can dress down the shirt and wear it casually by rolling the sleeves up or make it more fancy or work-like by wearing the sleeves down. It's also very comfortable to wear since the material is very light and feels silky smooth. I love the jeans from Old Navy because they have a good stretch to them. It fits nicely around the legs without being super tight and stiff. However, the one downside to these jeans is that the colour fades with each wash. I'll probably have to purchase a new pair of black jeans within the next year or else it'll look very worn out due to the faded look. These flats are probably the most edgy pair of footwear that I have (sorry, hope you don't mind a snap of my bare legs in this pic!) My favourite part of these shoes are the ankle straps. The overall strap consists of multiple mini straps with a silver buckle detailing on each. 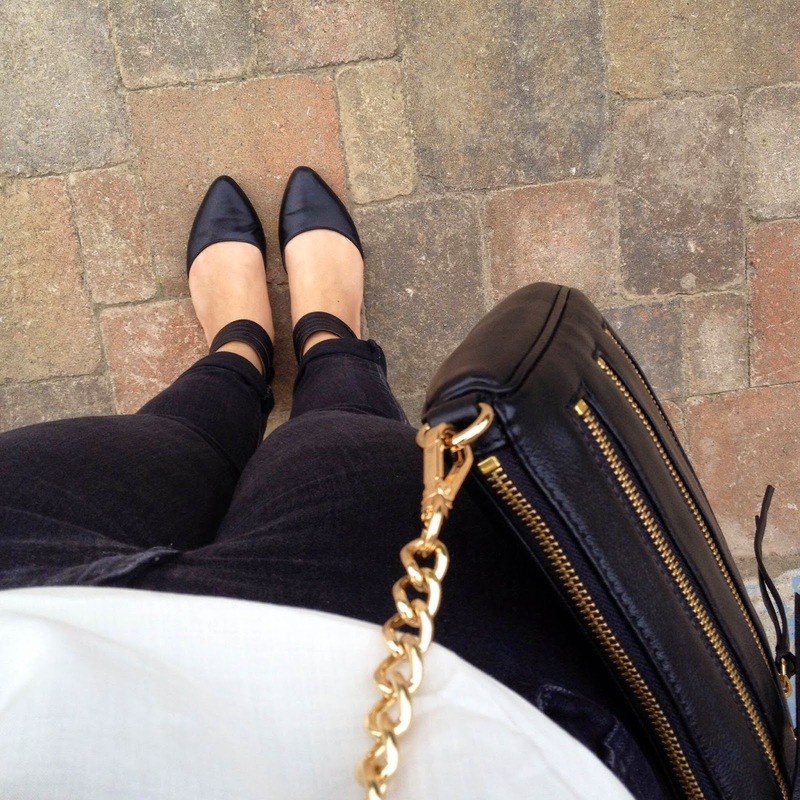 The flats also have a pointed toe which gives it a sophisticated feel to them. Some people think that the pointed toe style squeezes your toes inward and makes it painful to wear but that is definitely not the case...don't worry, your toes aren't suppose to fill the entire pointed section! The thick ankle strap and the pointed toe together steps it up from classic to edgy. The pointed toe flats made a comeback as a popular spring trend this year so it's nice to have this as a part of my wardrobe. What was your favourite spring trend? Let me know! I love your outfit! You look fab! Btw i hope you get the job at Aritiza - I have a friend who works there but she says its super exhausting maintaing sales quotas! Love this outfit, the flats are awesome. Thank you! :) I'm new to this whole blogging thing but glad to hear that there are people out there appreciating it!